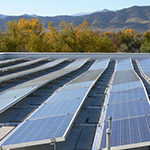 Boulder County strives to conserve energy and utilize renewable energy sources by promoting programs that help the entire community work toward energy efficiency and renewable energy use. Non-renewable sources of energy impact land, water and air across geographical scales. Locally, Colorado generates most of its electricity from coal-fired power plants which are one of the largest sources of air pollution in Colorado and in Boulder County; it is bad for health and it adds greenhouse gases to our atmosphere, contributing to climate change. The energy that we use to power, heat and cool our homes and commercial buildings is responsible for 56% of our greenhouse gas emissions as well as other pollutants. Boulder County strives to foster Energy Efficiency in Buildings that can minimize the amount of energy needed, which reduces these negative environmental impacts. The EnergySmart service offers expert technical and financial assistance for homes and businesses throughout Boulder County to use less energy through equipment upgrades, maintenance practices, direct actions, rebates and low-cost financing. Using renewable energy can provide a hedge against electricity price instability, fuel supply disruptions, and additional environmental regulation. Purchasing renewable energy demonstrates community and environmental leadership and helps maintain the high quality of life in Boulder. Use the savings from your energy efficiency efforts to fund the purchase of renewable energy resources. There are many opportunities to shift from fuels that generate greenhouse gases to cleaner, renewable energy sources such as wind and solar. Boulder County strives to foster building practices that improve environmental, economic and social qualities while minimizing negative impacts through our Comprehensive Plan and Land Use Code, guided by our BuildSmart, EnergySmart and Housing Authority programs and services. The county’s comprehensive plan (including the Sustainability Element) outlines a long-term vision, including goals, and policies. The plan addresses everything from Open Space and Transportation to cultural resources, economics, and Housing. Boulder County’s Land Use Code governs new development and building within unincorporated Boulder County preserving agricultural and open space lands, protecting mountain vistas and slopes and focusing on new urban development within established communities – thus reducing sprawl. 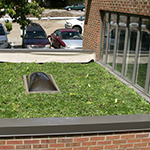 Helps local businesses strive for LEED standards and sustainable development.